Just joined today from So. Cal. Purchases a 2013 XCT Bronze Mist. Love it! Hope to get and share lots of info with everyone! Thanks. From one XCT Owner to another, welcome aboard! Great color choice, I've seen that color and is real sharp looking. What part of SOCAL you from? New to this thread. I am currently riding an 08 Vision Tour and enjoying everyday riding, especially here in Florida. Central Illinois I presently am riding a 2011 HD FLTRU, not a Victory of any kind. I am using my membership here to investigate the Victory, especially the Vision line for my future riding needs. If I find that the vision suits me, I will be in a completely different mode. If I do not find that to be the case, I am also very serious about the Yamaha Venture series of bikes. I have no particular loyalty to the Victory series bikes so I will be evaluating one bike against the other with no particular prejudice. One thing that I have seen so far in favor of the Victory is the net weight load limits. A Victory seems to have a huge passenger weight and luggage weight total advantage over my former preference, a Yamaha Venture. If that proves true with no other mitigating factors, I will soon be a Victory customer, but I have yet to get any true indication that my evaluations are right. I presently am riding a 2011 HD FLTRU, not a Victory of any kind. I am using my membership here to investigate the Victory, especially the Vision line for my future riding needs. If I find that the vision suits me, I will be in a completely different mode. If I do not find that to be the case, I am also very serious about the Yamaha Venture series of bikes. I have no particular loyalty to the Victory series bikes so I will be evaluating one bike against the other with no particular prejudice. One thing that I have seen so far in favor of the Victory is the net weight load limits. A Victory seems to have a huge passenger weight and luggage weight total advantage over my former preference, a Yamaha Venture. If that proves true with no other mitigating factors, I will soon be a Victory customer, but I have yet to get any true indication that my evaluations are right. Ride them both down the freeway, through some hills and curves, and over some rough railroad crossings. Then come back and tell us how much you like your new Vision. New Baden Illinois Thanks....just joined .....I ride a 08 Vegas Jackpot and i LOVE it. I live in New Baden Illinois and Love Riding around the St. Louis Area. Matt ... Welcome from Central Wisconsin! Might be over two weeks before I can even get my bike out of my driveway account of all the ice and snow. Nice ... I've motorcycled in the Smoky Mountains several times, plan on going to Colorado-Arizona-Utah in May. I've had good luck using photobucket.com and sizing pics at 640 x 480. Clinton, CT Noobie that just took delivery of a red Vision... Now Connie (my '09 Kawasaki Concours 14) has a new stablemate with Vicki! Have ridden various bikes and most recently sold an '04 Fatboy for the Vision. Hope to learn a ton here and looking forward to getting to know Vicki a little better! Welcome Allen, hope you enjoy the VV! So. Indiana Hello all. I've been looking into the Vision as my next daily ride. Currently I ride an ST1100, but have always wanted to own an American bike, but have had too many friends with Harleys in the shop. I had assumed Vision was in that bracket as well until I stumbled across an article about the reliability of the new Victory's. I'm hoping to catch one of the demo rides sometime this year. They styling on the Vision is really what drew me. Maybe a few too many electronic gadgets, but man... it's one cool looking bike. And with the MPGs and reliability where I need my bike to be, I'm really hoping this will be the bike I want it to be. 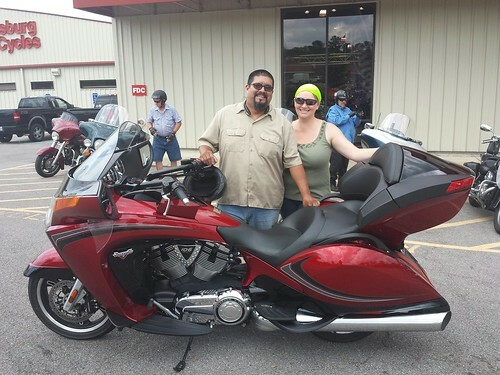 I believe you will find the reliability and the fuel mileage of the Victory Vision to be on par with the Honda Goldwing or your ST1100. Well, maybe not the fuel mileage of the ST1100. You can usually count on 40+ MPG on the Vision. So. Indiana Thanks. Yeah 40mpg is my minimum requirement. I remember seeing one when they first came out and assumed it was getting mid to low 30s. Actually there were a lot of assumptions that had to be dispelled. Jasper, MO Low to mid 40s for fuel mileage is pretty common with the Victory Vision when out on the road. The 6 speed transmission gives a true overdrive in 6th which allows the engine to turn only 2650 RPM at 70 MPH. 5th gear on the Vision is close to 5th gear (advertised as "overdrive") on the Goldwing, which turns 3000 RPM at 70 MPH. 3000 RPM on the Vision in 6th gear is 80 MPH. Mine actually gets its best economy running about 75 MPH (unless there's a stiff headwind). Add a little tailwind, and mid 40s at 80 MPH isn't uncommon. Romeoville IL Hello everone. I'm Morris from Romeoville IL just picked up 2012 Kingping and put a couple hundred miles tjis week end got to say love the ride and power it has. Pitt Meadows, BC Canada Went for a ride today to one of our favorite spots - on a beach near the U.S. border - where there is always a PARADE of cars and bikes up and down the promenade. We have lunch and watch the parade. Where dozens (hundreds?) of Harleys & Wannabe's motor by as we enjoy some of the best fish & chips in the world. They all have loud pipes and are very polished. But NONE of them could TOUCH my Vision in handling or performance. Makes my lunch MORE enjoyable. I know this to be true - I ain't afraid to have a go against anyone - ANYTHING - even at my somewhat advanced age. So I know what I say is TRUE !!!! New to this forum. Riding a 2012 Vision (red). Love that bike for just about everything. Great for long distance, sweet in the twisties. I get more comments on that bike than any I have ridden in the last 20 years. Hello all. I've been looking into the Vision as my next daily ride. Currently I ride an ST1100, but have always wanted to own an American bike, but have had too many friends with Harleys in the shop. I had assumed Vision was in that bracket as well until I stumbled across an article about the reliability of the new Victory's. I like the Vision styling. It is 100% different than anything else on the road. And it handles great, is fast and reliable and good mileage too. I'm averaging 43 MPG so far. Just wanted to drop by and say hey. I've been lurking for a week or so and like the board. I just recently (almost 2 weeks ago) bought a '13 Victory Vision. this is my second bike, my first is a '07 Honda Shadow Aero. Boy big difference when riding the Vision LOL. I will use the Vision as my weekend ride, my gf likes it better when we ride 2-up, gee I wonder why LOL. Lake Park, GA United States Greetings, I also am a "newbie" with a 2008 Vision Tour. Bought in June and have just under 5900 miles on my "1st wife (according to my wife)" It is by far the best bike I have had thus far. Lake Park, GA United States Matt, Hello I am Jussely, Eddie I purchased my Vision 3 months after you posted this , but I was a Ms resident, so after a month or so I decided that I wanted to take a little road trip and went to the J-action area to visit the family..... Great ride from somewhere between Tallahasee and Jacksonville Florida our capital of Ms. I am looking forward to the next time I can do the trip! Welcome to the site! Glad to hear that you are putting some time on your VV. Oldman47 - 2013-03-05 8:57 PM I presently am riding a 2011 HD FLTRU, not a Victory of any kind. I am using my membership here to investigate the Victory, especially the Vision line for my future riding needs. If I find that the vision suits me, I will be in a completely different mode. If I do not find that to be the case, I am also very serious about the Yamaha Venture series of bikes. I have no particular loyalty to the Victory series bikes so I will be evaluating one bike against the other with no particular prejudice. One thing that I have seen so far in favor of the Victory is the net weight load limits. A Victory seems to have a huge passenger weight and luggage weight total advantage over my former preference, a Yamaha Venture. If that proves true with no other mitigating factors, I will soon be a Victory customer, but I have yet to get any true indication that my evaluations are right. Just an update - I rode one and now I own one with 7150 miles on it since mid-May. The FLTRU is history. My mods include the timing wheel, passenger arm rests and lower air controls.